Due to iTunes FairPlay DRM restriction, audio files including Apple Music, iTunes songs, audiobooks and any other audio tracks can only be played on the specific players or devices from Apple. If you are tired of this limitation and want to play the protected audio files on any cross-platform device, such as Android, Windows etc., you just need to use the TunesKit DRM Audio Converter to strip the DRM protection easily from Apple Music and iTunes M4P, M4A, M4B audiobooks as well as Audible AA, AAX files. Some specific formats of music files are not supported widely, as a result you may encounter the error that they are not recognized time from time if you have multiple different sources of audio tracks. TunesKit DRM Audio Converter for Mac is here to help you play all kinds of music, audiobooks, etc. 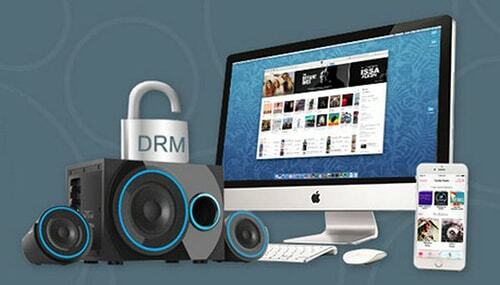 on any device freely by converting the DRM and non-DRM audios to popular formats, such as MP3, M4A, AAC, etc. Wanna make your own music with more exciting personalities? TunesKit DRM Audio Convert for Mac allows you to customize the output audio files, such as changing the volume, speed, pitch, set the codec, channel, sample rate, bit rate, etc. Furthermore, it can help you cut the long music files to small pieces either by time, chapter or segments, so that you can choose the exact part of your music to play without any problem. It is common that some audio files may have incorrect tab info especially for the old music files or some audio tracks recorded personally. To remove any mess and make it easier for you to look up your files, TunesKit Audio Converter for Mac integrates the options for you to edit your music tab info including title, album, artist, composer, copyright, year, genre, cover and more. After that, your files will be more organized. TunesKit Mac DRM Audio Converter takes advantages of the latest multiple-thread audio conversion technology, which can convert the DRM-ed or non-DRM audio files at a 30X faster speed while at the same time maintaining high quality for the output files. What's more, for the Audible AA or AAX audiobooks, you can choose to preserve the 100% original quality in the output audios. TunesKit DRM Audio Converter for Mac is a superior audio converting software. It comes with all the best features for handling audio files such as remove DRM, convert audio formats, customize playback settings and so on. No matter what you need to do with your audio files or what kinds of music you have, you can always let this smart tool to help you quickly and reliably.